Sonam And Deepika Prove That *Gold Goddesses* Come In Different Forms! Last night we all witnessed something that commoners like us rarely get to see- a royal couple, having a royal reception. DeepVeer looked absolutely ethereal as they decked up in white and gold for their Mumbai function. They laughed, posed for the shutterbugs and embodied what love looks like. Looking at DP, I was reminded of another Bollywood bride dressed in white and gold for her mehendi function. Yup, Sonam Kapoor looked ethereal in a white and gold lehenga. 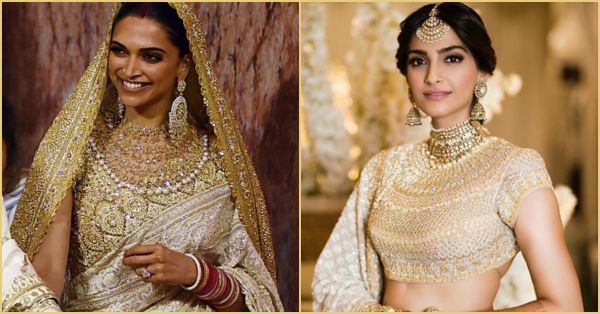 Both Deepika and Sonam chose the classic tones of whites and gold for their wedding functions. But even though their outfits were of the same colours the final look was completely different. Both the actresses wore Abu Jani and Sandeep Khosla and this designer duo really seems to be much loved. Even Priyanka Chopra wore a suit from their collection and she too looked stunning on her roka. Both their lehengas were embroidered with the same kind of work. They both had detailing of chikankari and they looked so stunning. The white on white just gives that classy and classic feel, right!? Even though the colours were the same, so was the work and so were the designers, still the lehengas looked completely different. This is because of the styling. Sonam kept it young and fresh with a backless blouse while Deepika had a more royal and elegant style to be the Mastani to Ranveer's Bajirao. Sonam's hairstyle for this function was probably my favourite one, she tied it all up in a long braid and decorated it with gajras. DP (as usual) played it safe with her patented bun that she's been wearing for all her functions again tying in with that regal look. Sonam chose to wear a kundan choker with pearls along with a maang tikka and jumkas for jewellery but Deepika went all out with her rani haar made with diamonds and pearls almost saying, "Make way for the kween!" Sonam's jewels were from her mother's label while DP's jewels were designed by Abu Jani and Sandeep Khosla. 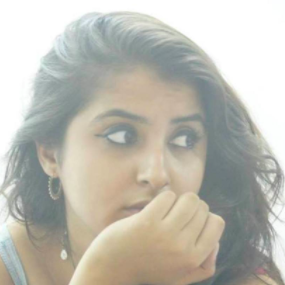 The dupatta styles were so completely different and that's what made all the difference. Deepika wore a double dupatta, one covering her head with her resplendent gold border shining and the other was draped like a saree diagonally. Sonam went with a single dupatta draped casually on her shoulder. So who wore it better guys? !